I watched Rocky at the perfect time — I was very sick and needed to spend some time resting. What better way to get me through a nasty illness than by watching one of the most popular (and inspirational) sports films of all time? 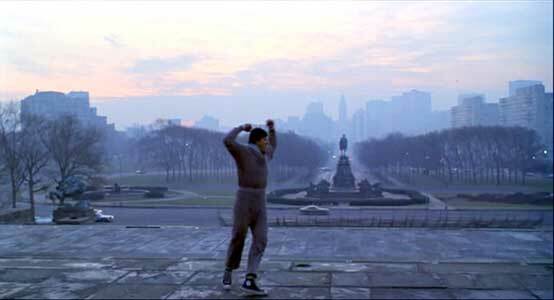 Now six films deep, the original Rocky is still regarded as the best of the series. Sylvester Stallone, a virtual unknown at the time, wrote the screenplay and starred as the eponymous Rocky Balboa, an underachieving Philadelphia boxer who works as a debt collector on the side. He is poorly educated and fights in dimly light venues, often bringing in just a small cut of the gate revenue. Little does he know it, but Balboa is about to get the biggest break of his life. Undefeated world heavyweight champion Apollo Creed (Carl Weathers), a flamboyant and cocky star, is coming into town for a championship bout on New Year’s Day 1976, the year of the U.S. Bicentennial. After his opponent becomes injured, Creed comes up with the idea of giving a local fighter a shot at his title. While scouring through names of those in the city, he stumbles upon the “Italian Stallion” — Rocky Balboa. It’s as if you can see the light bulb and/or dollar signs appear over Apollo’s head. This is his man. 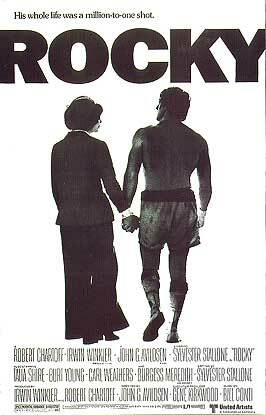 Aided by his friend Paulie (Burt Young), his quiet-and-reserved girlfriend Adrien (Talia Shire) and his trainer Mickey (Burgess Meredith), Rocky begins training for a fight he never expected to have. Hell, Rocky doesn’t even think he can beat Apollo — he just wants to go the distance (something never accomplished against the champion). At its core, Rocky (the film) is a terrific underdog story. This is the stuff small-time and aspiring boxers (and other athletes) dream of — to break through and get their big moment. In a way, it is a glimpse at the American Dream, working hard to catch that big break. Of course, in Rocky’s case it was dumb luck (or rather, a catchy nickname) that got him his title match, but the sentiment is the same. While pop culture has somewhat diluted the story of Rocky over the years, the fact remains that this is still an uplifting film. It is presented in a way that is very easy to digest, and the movie is one that most will be able to relate to. The fact that this was selected as Best Picture winner over several other greats such as Taxi Driver, All the President’s Men and Network, runs parallel to the film’s underdog story. With a classic rags-to-riches story, strong action scenes and an unforgettable soundtrack, Rocky is still enjoyable today. Fine review, Eric. Yeah, this is the underdog of underdog stories, alright. There are still a number of folk out there pretty sore that any of the other Best Picture contenders didn’t get that Oscar. Still, this one remains the best of the series and has a lot of heart. Thanks, Michael. I can see why Rocky won Best Picture, especially since it’s such a feel-good story, but yeah, I still prefer Taxi Driver and Network. All great films, though. I couldn’t believe how little boxing there is in it! Didn’t leave me with much of an urge to watch the rest either but I see why it’s a classic! Yeah, that’s a good point — there really isn’t a whole lot of boxing in it. I actually just watched Rocky II and there’s even less boxing, just the big fight at the end. Not what I was expecting. The perfomances are great here too. Stallone is incredible as the sad sack down and out Balboa. Carl Weathers was born to put his own spin on an Ali like character. Who doesnt love Burt Young as Paulie? And Talia Shire is great here too as the nervous, painfully shy Adrian. I cant forget Burgess Meredith delivering the role of his lifetime as the Mickey, the trainer with one last shot. All except for Weathers received Oscar noms for their roles. Ahhh, I really should have went into detail on the performances. Thanks for having my back, Fogs, I agree on all fronts. Talia Shire was the real highlight for me — she was terrific in such a reserved role. It doesn’t matter how many times I watch this classic, I still find myself bellowing Rockys name and expecting a victorious ending. Haha it’s definitely easy to get caught up in that last fight. Couldn’t ask for a better ending either. The Stallonarama (or is that Stallonaroma) is a brilliant idea for a movie matrhaon (it sure beats the James Bond matrhaons I used to have as a kid). I agree that you\’ve probably hit a high point in Stallone\’s oeuvre. Here\’s another indication that it\’s all downhill after this: the Rocky song was used as Bob Dole\’s fight song at the 1996 Republican National Convention.Although the original First Blood is not without its charm. Have you read Susan Faludi\’s take on the Rambo phenomenon in her book Stiffed? It\’s well worth checking out after you\’ve seen John Rambo in all his cinematic sequelia glory. She also considers the dramatic differences between the film and , in which John Rambo is much more, uh, how shall I say it, morally compromised? I just saw this for the first time this year as well. Great, great film. I’m not even a sports fan, and I loved it. Good deal! Glad to hear I’m not alone on seeing this one so late. Have you went for any of the sequels yet? Yeah, I bought a two-pack with Rocky I & II, so I watched II a few weeks ago. It’s also really good. Nice. 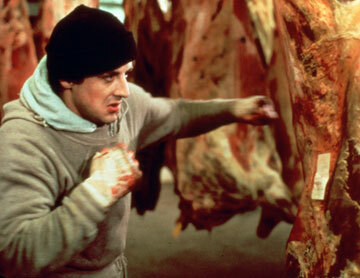 I noticed that Rocky 2-5 are now on Netflix Instant so I’m working my way through them. It has been good fun so far. Excellent. I don’t have Netflix, but it’s things like that which make me consider it once in a while. You are so detailed, but at the same time, very cflurool and enjoyable. I normally don’t spend the time reading long reviews, but you gave many comparison/contrasts to both that I not only want to go to the movies and watch Real Steel, but also Rocky too. Sorry to hear about your illness, Eric,get well soon,buddy. That image on the steps sure is iconic! Which movie do you prefer, Rocky or First Blood? I found John Rambo to be the more mysterious of the two characters, but probably Rocky is more likeable and inspirational! Ahah, that’s the line my Swiss friend had to say in our Rocky skit. I wish I had videotaped it! I love the whole Rocky franchise, but this one really packs a big emotional punch. It’s THE underdog story, not just for Rocky but for Stallone. Having to fight to actually play Rocky himself. I just watched about a couple of months ago and I realized just how amazing this movie truly is. Yeah, it’s predictable and full of cliches now, but back in the day, it was just so inspirational and great to see someone like Stallone come up from the lower ranks and knock Creed’s teeth in. Great movie. Great review Eric. Thanks Dan, glad to hear you enjoyed it as well. Did you go for any of the sequels afterward? All of them but that lost one with Tommy Gunn just blew. I ended up watching all but Rocky Balboa, and yeah, I agree Rocky V wasn’t that great. Ending the movie with a ridiculous street fight? Tommy Gunn was so lame, too. Curious to see how Rocky Balboa wraps it up — I’ve got that coming next on Netflix.